Even though it’s already August, summer isn’t over yet! 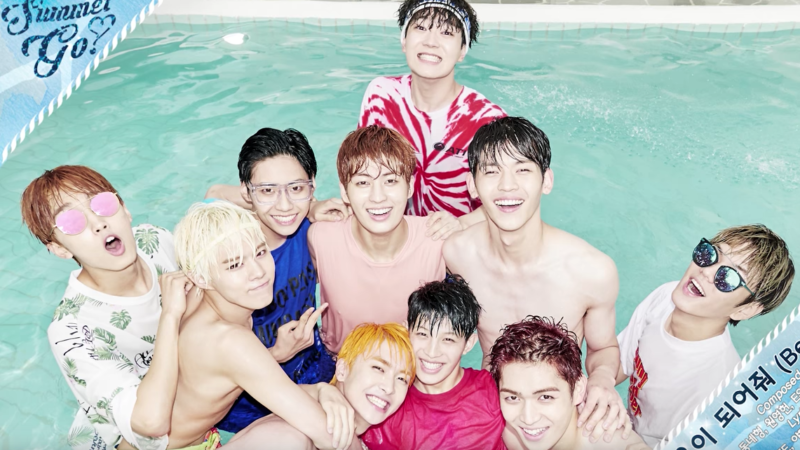 The hot 11-member boy group Up10tion has made a sensational comeback with their new song ‘Tonight’! From pool fun to popcorn, we couldn’t have asked for more! The music video takes place at various sites, including the capital of South Korea. Here, the members are running around and enjoying a carefree summer. Throughout the MV, the boys get up to all sorts together, including carrying around and playing with disco balls. These are undoubtedly a symbol for parties and of course dancing. Similar to Seventeen’s Very Nice (click here for our review) we think that this comeback’s concept is the celebration of youth, and this is reflected in the lyrics which talk about a boy and a girl running away from it all in the middle of the night. Speaking of dancing, although this music video has some storyline to it, there’s dancing from time to time as well. Most of the choreography shows all the boys moving in unison which makes it all the more powerful. Yet the way they are smiling shows that they are having lots of fun which is what we like to see! What we love most about this music video is the bright colours of the various sets and also their outfits. It really enhances the summery feel for us and put us in high spirits. If you’re in need of a pick-me-up, or want to listen to something new, then why not give ‘Tonight’ a try!